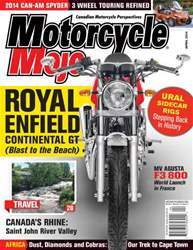 In this issue we report from the British press launch of the Royal Enfield Continental GT, the newest production cafe racer to grace the world's roads. Also in this issue is the Can-Am Spyder RT and its new purpose-built three cylinder powerplant. 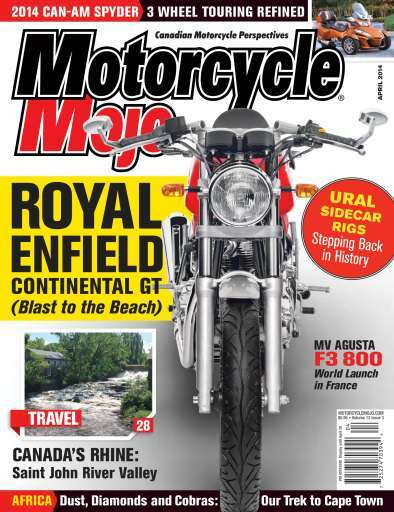 Rounding out our tests is the Ural Tourist and Patrol models, and a quick track report on the MV Agusta F3 800. In travel we have part two of 'Riding the Dark Continent' (the first part appeared in the March issue) and 'Cruising the Canadian Rhine', a travel piece through the Saint John River Valley in New Brunswick, Canada.